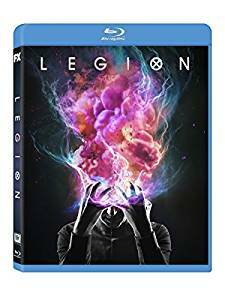 No, this is not a continuation of the movie Legion - that honour goes to the TV whow Dominion . Instead, it is based on a Marvel comic-book series by Chris Claremont. The producers include Brian Singer , and the Executive Producer list has names like Stan Lee and Joe Quesada. David Haller (Dan Stevens - The Guest ) was institutionalised with a diagnosis of schizophrenia. He gets to hang out with gal-pal Lenny Busker ( Aubrey Plaza ), but soon falls for new patient Syd Barrett ( Rachel Keller ). This is not a cheesy rip-off like Mutant X . It has a glossy sheen, like Limitless ... but also illustrates how telepathy could be associated with mental illness (like in Scanners ). David Haller (Dan Stevens - The Guest ) is in a different mental health facility. This one is much nicer, run by Melanie Bird ( Jean Smart ). She has her own telepath help dig up David's memories. He had some bad experiences in his childhood, and as an adult he spent a lot of time with a psychiatrist. There is a nasty undercurrent to the story. Much like the previous episode, we are left wondering which scenes are genuine memories. Melanie Bird ( Jean Smart ) and her minions continue to pry into the mind of David Haller (Dan Stevens - The Guest ). David has a Yellow-Eyed Demon living in his mind. Not like the one in Supernatural - no, this one looks more like Slimer the Sedgewick Spud in Ghostbusters . It may be a subconscious manifestation, or it may be a psychic parasite that has burrowed into his mind. Strangely it seems to come out when he thinks about Lenny Busker ( Aubrey Plaza ). This is a pity, because she is easily the best character in the show. David makes contact with his sister, who is being held prisoner by the Men in Brown. David Haller (Dan Stevens - The Guest ) is locked in a comatose state. It turns out his mind is in the astral plane. The others cannot find his mind. They go on a road trip to find his ex-girlfriend. As a result they make an amazing discovery about Lenny Busker ( Aubrey Plaza ). David's sister is not the only prisoner. His psychiatrist is in the next cell. They manage to strike up a conversation, and uncover yet more inconsistencies in David's memories. David Haller (Dan Stevens - The Guest ) bonds with his love interest, Syd Barrett ( Rachel Keller ). It helps that they have realised their powers are limited to their physical bodies, so she is able to touch him as long as they are in a shared psychic halucination. David insists on rescuing his sister. Lenny Busker ( Aubrey Plaza ) offers her assistance in the matter. After all, it is obviously a trap so there is no point in getting the others killed too. But will David and Lenny be able to take out the massive garrison of police? And will they bother to save the innocent psychistrist who is also a prisoner there? David Haller (Dan Stevens - The Guest ) is trapped in a shared halucination with his friends. They are inmates in a version of the asylum, and their psychiatrist is Lenny Busker ( Aubrey Plaza ). Melanie Bird ( Jean Smart ) is in the shared halucination too. Ironically, this is the closest she has been to her husband since he was lost, years previously. Lenny Busker ( Aubrey Plaza ) has everyone trapped. However, the man in the ice cube has a plan to save them. As always, this show is a visual feat for the eyes. This episode more so than the others, because Lenny converts their reality into a monochrome silent movie. David Haller (Dan Stevens - The Guest ) is confronted by his rational self, a version of himself that lives in his subconscious. Since his rational self is an embodiment of pure logic he speaks in Recieved Pronunciation, and since the actor has an English accent we can hear what he really sounds like. The interrogator from the first episode is back. He managed to survive, with 40 percent burns and six weeks in intensive care. Now he goes after the mutants. Lenny Busker ( Aubrey Plaza ) is now the one who is trapped. However, she has a plan for a breakout. The new Season starts off in a somewhat confusing way. If you watched Season One of the show, you will already know that this story is basically about a war between telepaths. If you have not watched it, and thus know nothing about the characters or situations, you will be incredibly confused about everything. David Haller (Dan Stevens - The Guest ) is informed he was missing for almost a year. Now he is back, and gets told that the Mutant Underground has teamed up with the MIBs to fight their mutual enemies. The Shadow King is top of the list. David gets his powers boosted so he can get into the Shadow King's head. Oliver and Lenny are hanging out there, and he has a dance-off with them. David Haller (Dan Stevens - The Guest ) leads the team into the desert, in the hope they will catch the Shadow King there. Meanwhile, the Shadow King attacks their HQ. Kerry and Cary try to hold him off, but he messes them up. David communes with a woman from the future. She tells him that he will defeat the Shadow King, but the monster that follows will destroy the world. This is a standard set-up for a new Season, although it usually comes towards the end of the previous one.